City of Helsinki, Nokia and Elisa are looking for a standard model design for the Helsinki 5G base stations in collaboration with Ornamo Art and Design Finland. In the published design contest organizers are seeking unique and easily scalable model for base stations which are to be utilized in Helsinki City environment. Helsinki aims to be the city in the world that makes the best use of digitalization. A major aspect of this utilisation are faster and more reliable network connections. This goal is currently being pursued, in particular, by developing 5G network environments and hardware. 5G networks reduce delays, provide a larger data transmission capacity and decrease the energy consumption of networks. They will make it possible to gather and use diverse sensor data more extensively, for example. 5G networks also require a denser network of base stations, creating challenges from the perspective of the urban environment, in particular. An environment with multiple operators also adds to the challenges, since each network operator needs their own base station. The density of the base station network also means that the base station needs of all operators should be addressed as effectively as possible while ensuring that we do not compromise the city landscape. In practice, this can be achieved by reserving space for several base stations in one point. The appearance of the complex of several base stations should be harmonious which is very challenging in terms of design. Although the 5G technology has advanced in leaps and bounds, efforts to align these requirements and opportunities externally to the urban landscape have been rare. 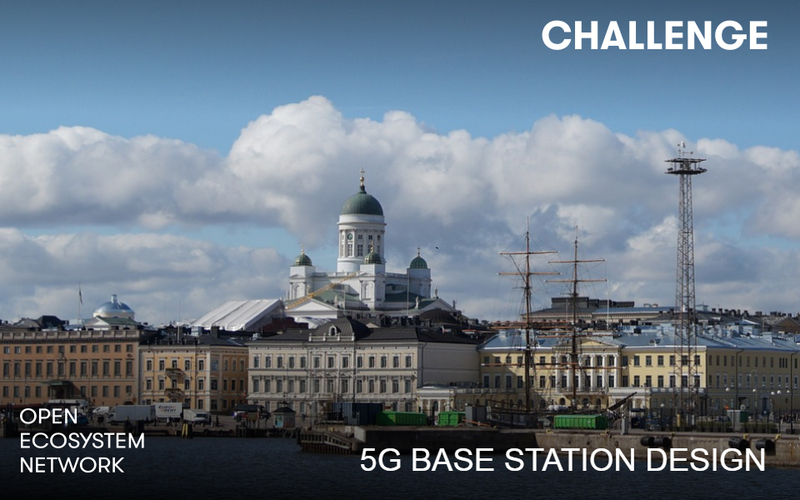 The objective of the 5G design contest is to find an elegant standard model for the Helsinki 5G base stations and network environment. We are seeking for both a model that attaches itself to existing city infrastructure as well as a standalone model. The goal is that base station design seems as a natural part of the surrounding city environment. It considers the diversity of both citizens and the city environment and yet is mouldable according to the needs of varying settings. Kansalaistori square’s proximity has been selected as the contest area due to the variety of environments it provides. The deadline for entries is on Nov, 18,.2018. The top 5 entries will take a part in a public poll and the ranking order of 3 most popular entries will be announced in January 2019 by the contest Jury. Top 3 entries will receive total of 35,000 euros prize money and all the entries in the public poll will receive honourable mentions. All interested parties are welcomed to submit their entries by Nov, 18.2018.